Many academic women say that they feel “pulled in a thousand directions.” That’s the main reason they cite for not having time to write. One of the reasons you might feel pulled is that you are pulled. We are asked to do too many things–and too many different kinds of things–as part of our academic careers. Teaching, student mentoring, committee meetings–it all feels very overwhelming. If you feel like you are constantly putting out fires, that you are reacting instead of acting when opportunities (and problems) come your way, like everything is just too much and you want to get off this runaway train, then you need an Academic Mission Statement. Writing an Academic Mission Statement is the first step to finding focus and taking control of your career. When you clarify and articulate your mission, you can then work to line up all your activities so that they are serving this mission. The result of having everything line up is that you stop feeling so pulled. Everything supports the mission, so you reduce the task-switching cost of being an academic, which is draining your time and energy. But first thing’s first: you need to write the Academic Mission Statement. 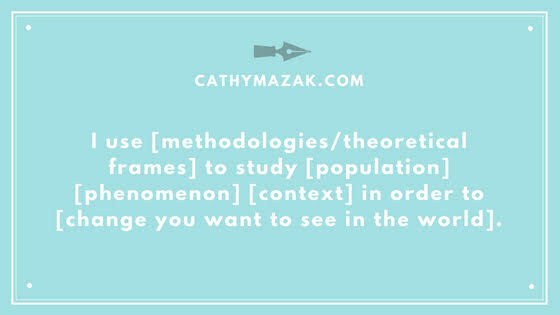 I use [methodologies/theoretical frames] to study [population] [phenomenon] [context] in order to [change you want to see in the world]. I use ethnographic methods to study translanguaging in Puerto Rican university classrooms in order to normalize bilingual content learning and inform theories of bilingualism. If you write this statement and then just keep sailing along, the helpfulness of this exercise will wear off. So let’s really talk about how to use an academic mission statement. Focus your intention: I’m not trying to sound all “woo” here but how we think about our careers and the day-to-day activities that make up our careers matters. So once you have your mission statement, put it in your workspace and read it first thing in the morning before you get to work. Commit to doing this every day for two weeks. This exercise will focus your intention and set you on a clear path for the day. Use your statement to make decisions: Your academic mission statement is like a litmus test for the many decisions you need to make about your time. Your mission should remind you that you have big, important work to do. When opportunities (however awesome they may be) come up that won’t have a direct impact on advancing your mission, you should say no. Your mission should drive your writing and presenting: Use your mission statement to make choices about the audiences you want to impact. Who do you want reading your work? Where should you be presenting in order to get your big message out there? Use you mission statement to make those choices strategically. You may feel that having a mission statement makes you inflexible or “stuck” on one path, and less able to react to new opportunities (hello there my free spirits!). Your Academic Mission Statement is not etched in stone, but rather should evolve as you evolve professionally. For this reason, you should re-visit your mission statement at the beginning of every semester and once in the summer. Do a gut-check to see if the mission is still you or if you need to revise and add a new twist or angle. Click here to get the mini course right to your inbox!